Just when you think you got it made, something comes up and smacks you right across the back of your head. 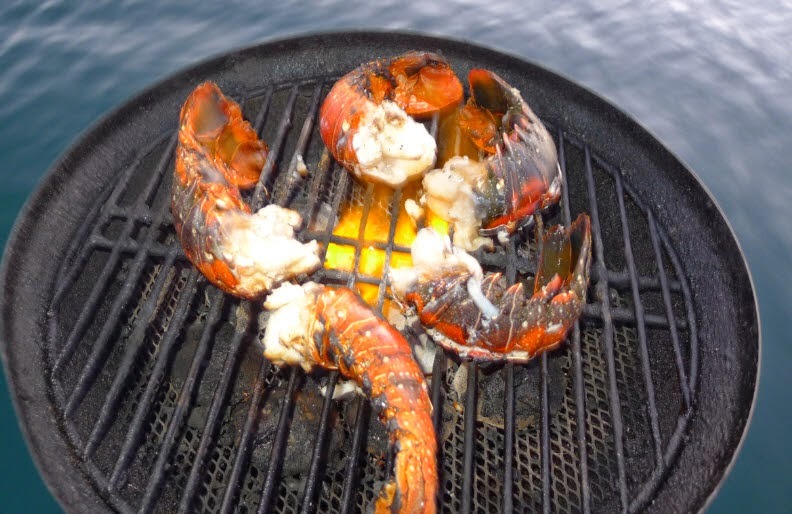 One day you are feasting on fresh lobster tail and chilled white wine. The next you are tacking close hauled in 20 knots with a failing engine. 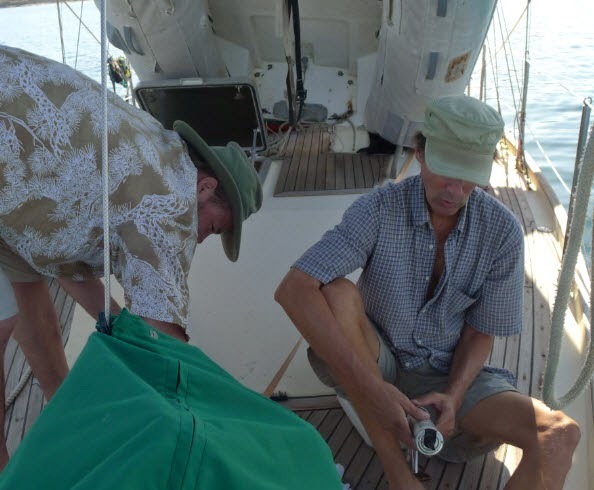 We are here in Puerto Escondido, about 85 NM north of LaPaz and 120 NM southwest of San Carlos, swinging on a sturdy mooring ball while Connie sews up some awing material. We've got internet now and can do some research and catch up on email. What am I researching, you ask? 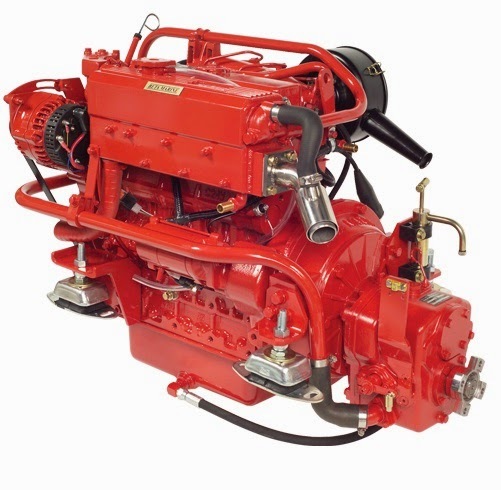 I'm researching diesel mechanics and engine re-power options because our engine is failing! That's right! With only 200 hours on an eight thousand dollar rebuild, our Perkins 4-108 is making serious interior clunking sounds. It's not the valve train, or anything in the top of the engine. This baby is gut-shot. Serious stuff. 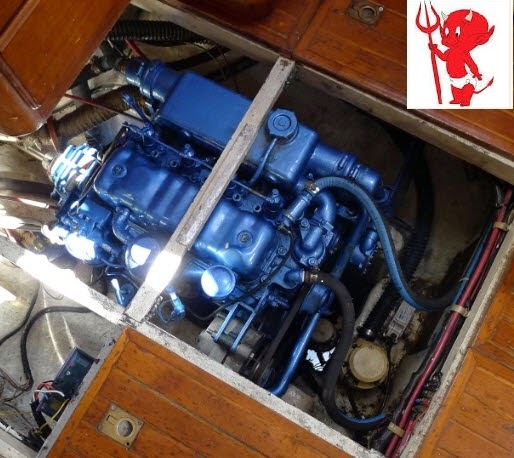 We spoke with the folks on s/v Hajime and they had their Perkins 4-108 rebuilt by Rafa at Total Yacht Works right before we had ours rebuilt there. Their engine didn't last 1500 hours before it started knocking. And when they pulled it out of the boat and had it disassembled the mechanics found plenty of problems. They ordered a Beta engine and re-powered in La Cruz. Red is a good color for a new devil! The Beta 43 HP. And we heard about our friends Millie and James on s/v Jean Marie. We had met them at the dock in Mazatlan where they had their Perkins 4-108 rebuilt by Rafa. It lasted long enough to get them to San Carlos then back down to La Cruz where they took a look inside and found more problems. They are re-powering with a Beta 43. We can read the writing on the wall. We realize that our engine is a time bomb and not the trusty work horse we wish to have. Now we get to use our sailing and navigation skills to move this 30,000 pound boat up and across the Sea of Cortez without the aid of the auxiliary engine. A southeast wind is expected on Sunday so we'll take advantage of it and work our way north giving ourselves plenty of time to move between safe harbors. We'll choose the open bays that are easy to sail into and out of and take our time exploring on foot and in the dinghy all those beautiful places we've read about between here and Bahia Concepcion. Once at the 27 degree north latitude we'll make the 70 mile jump across the Sea of Cortez and make landfall near San Carlos. There we'll decide which yard to haul out in and who we might hire to remove our old Perkins time bomb. Thanks Rafa. And if you are feeling sorry for us.... don't. It is beautiful out here. The outer harbor of Puerto Escondido. In the background are the Sierra Gigantas. After a wonderful six month season cruising down the Mexico coast we returned to Mazatlan and picked up crew. On the crossing over to Muertos, we noticed a vibration and slight knock in the engine. Connie went over the side and removed a loose zinc. We continued on with a slight vibration. Then later in La Paz I thought the vibration was getting worse so we checked the motor mounts and found one loose. And we found her to be 1.5 liters low on oil! Added oil, tightened the motor mount and continued on. Just past Bahia Agua Verde we shut off the motor and sailed for the rest of the day til late afternoon when the wind died. Ten minutes after restart and sails-down the engine went from it's usual cacophony of noise to one much more clackety clackity. Connie throttled it down and I gave her the kill hand symbol, you know, the one where you slit your throat. Slit the throat we did and the wind picked up and we rolled out the Genoa just as we approached a difficult set of rocks and islets guarding the entrance to the Los Candeleros (Candelsticks). "Where should I steer?" she asked. "Right between those two rocks!" 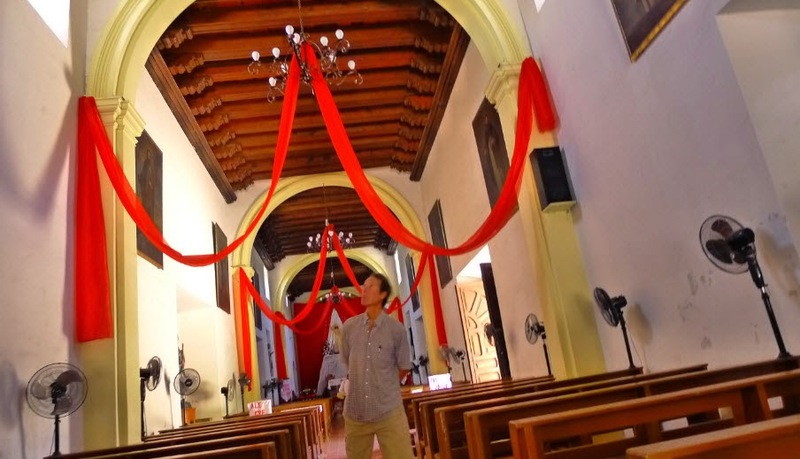 Scott in the Loreto Mission looking for answers and candles to light. I'm down below with my head in the bilge looking for problems. Seeing none we do a restart and hear the clackety clack. So we sail through the maize of rocks and head north towards our chosen anchorage. By the time we got up there a roaring southwester had come up making the anchorage way too bouncy. So we tacked around and headed back south, upwind towards the Candeleros anchorage. The wind builds. The Genoa is way too much sail so I roll it in halfway. We have to tack... cause the anchorage is upwind of us. When we tack, the Genoa gets stuck a little then comes over with a 39" rip in the luff. OK. Now our diesel is making bad noises so we should not really use it. Our main method of forward propulsion, the Genoa, is damaged and we really should roll it up before it tears itself to pieces. Roll it up we do and I go forward and raise the staysail. We work our way upwind with a tiny foresail and a full main, not the best sail combination. In this manner we finally make the Los Candeleros anchorage where we attempt to anchor under sail. As Traveler approaches the selected spot Connie drops the main and the boat comes to an abrupt stop, not coasting a little bit further as I expected. The bow falls off while Connie drops the staysail. Traveler pivots and I steer (not sailing anymore) back around in a "wearing" maneuver. Once clear we need to point a little upwind so I start the engine and use it just long enough to round up. I shut off the evil clanking diesel and holler out to connie, "Drop it!" She dumps the anchor and Traveler settles back, hauling out about 150 feet of chain in the 30 ft water. We come to a stop, firmly planted, wipe the sweat off our brows, take a shot of Havana Club, then get about cleaning up the messy deck full of lines and dumped sails. We hear a sigh of relief throughout the anchorage as our neighbors let out their collective breath. The next day we sail successfully north into Puerto Escondido (Nearest harbor to Loreto) where we are lucky enough to be offered a nice safe mooring ball from Terry and Dawn on the trimaran Manta. Our buddy Alex on Luna Sea comes over and we open up the top end of the engine and reset the valve clearance and look for problems there. Finding none we realize that the problem is much deeper and more serious than can be resolved easily. And that's our story and we're sticking to it. "The advantage of belonging nowhere is that you manage to feel comfortable anywhere." Now… for you techies out there: How about a water maker installation? 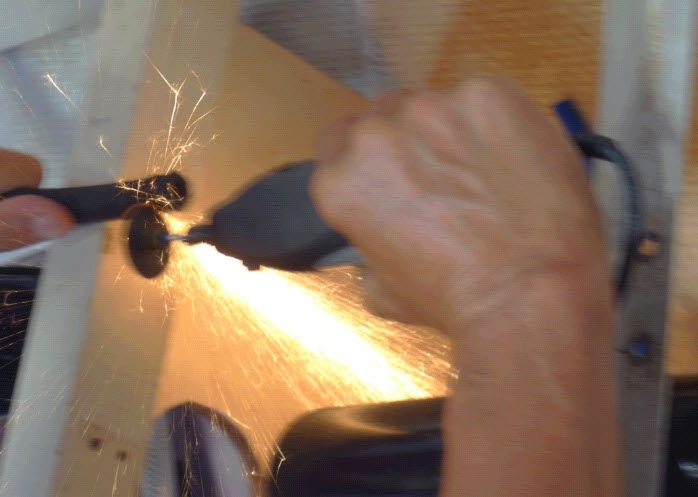 Dremel tool cutting the high pressure hose. Nice sparks, huh? I searched on the web. I talked to experts and liars on the docks; hard to tell the difference. I read books and magazines. I considered the Cruise RO and the Spectra. The Cruise Ro uses standard parts which are easily replaced and it uses the ubiquitous Honda 2000 generator as a power source. The Spectra is the gold standard of 12 volt systems and there are folks in Mazatlan and La Paz who can service it. But I’d done business with the folks who make the Hydrovane wind vane system and respect that design for being simple and sturdy. You might say their systems are overbuilt. But on a boat, tough and simple is a good thing. So we went for the EchoTec, from the makers of the Hydrovane. I ordered it with lots of emails back and forth with a guy named Will and had it delivered to Connie’s sister’s house in Phoenix. We picked it up there a few weeks ago. Price tag? Let’s not go there. Look it up yourself. At the border we got the green light… twice, so we did not have to show our paperwork proving that the unit was for a boat imported into Mexico. When you go through customs in a car, you pull to a stop light and randomly get a red or green light. If red, you pull over for inspection. If green, you boogie on your way. We boogied. Back at the boat in Mazatlan, we stashed all the water maker parts under the port side settee then did the crossing of the Sea of Cortez over to La Paz. Once anchored there in the bay we started in on the installation. This install is right up my alley. It’s just a bunch of lightweight plumbing, some electrical, and a fair amount of mounting things to bulkheads and cabinetry. I had about eight different gizmos that had to be connected together. The great thing is that all this stuff does not have to be in one place. You can spread it all out using the extra spaces under cabinets and floorboards. I started with the big stuff. The largest item is the compressor and motor. This is a heavy dude and has to be firmly bolted down on its rubber mounts. I found space under the port side settee. Then there is the four foot long reverse osmosis membrane. It fit in forward of the compressor. I cut a square out of the teak under the settee and mounted the control panel down low, close to the compressor but where I could see it clearly. 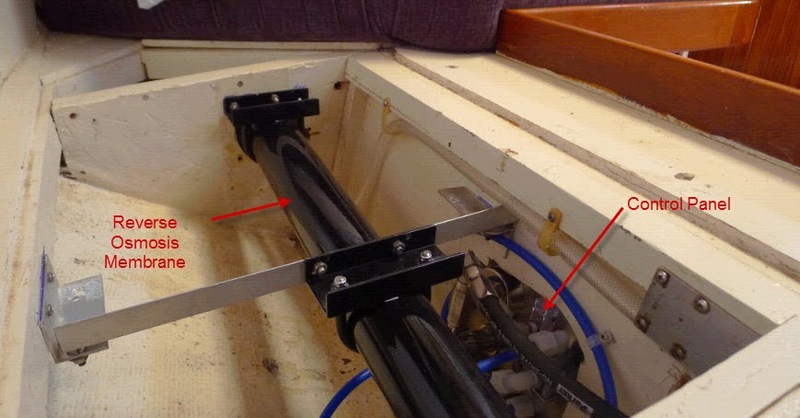 There is a space under the floorboards near the mast that has about 24 inches of clearance. That worked well for the pre-filtration system and the post treatment. Back in the galley I had an unused thru-hull so that’s where I put the sea strainer and boost pump. So here is how it works. The sea water comes into the boat through a valve. It passes through a strainer and goes to a little pump that gives it some pressure to push the salt water through the various filters. The pressurized sea water goes through a 20 micron filter then a 5 micron filter. Now it is pretty darn clean. But wait. Sometimes you want to back flush the system with clean water so we also mounted a fresh water carbon filter that you can switch on when you want to flush. The carbon filter uses clean, not salty, water from the fresh water tanks to flush the system. Carbon removes chlorine. There is a hint of chlorine in our 150 gallon water tank. Chlorine harms the reverse osmosis membrane so it has to be removed if flushing with dock water or other chlorinated water. And then when you leave the water maker unused for the summer you have to push a pickling solution into the membrane. So we have a valve and hose to do that. 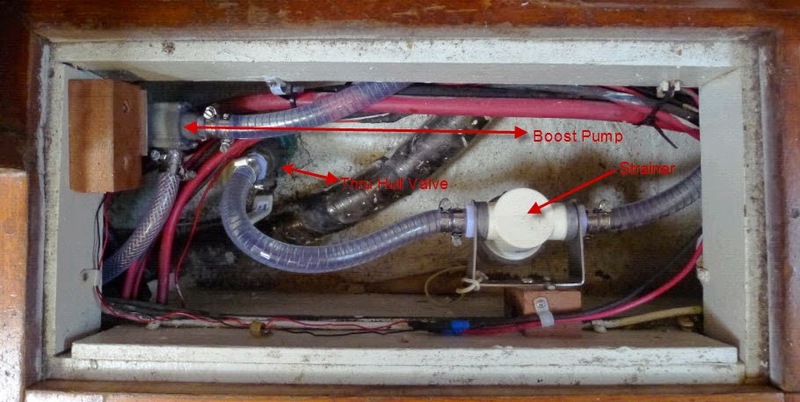 To summarize, there are three options providing liquid to the pump and membrane: The filtered salt water, for making water, the fresh water rinse with chlorine removed by the charcoal filter and the connection to the pickling solution for when you want to store the water maker for the summer. After all that foldoral and fiddle dee dee the water gets to the big mamma high pressure pump. This is a big dog of a unit sucking 20 to 38 amps per hour, depending on how far you turn the pressure valve. 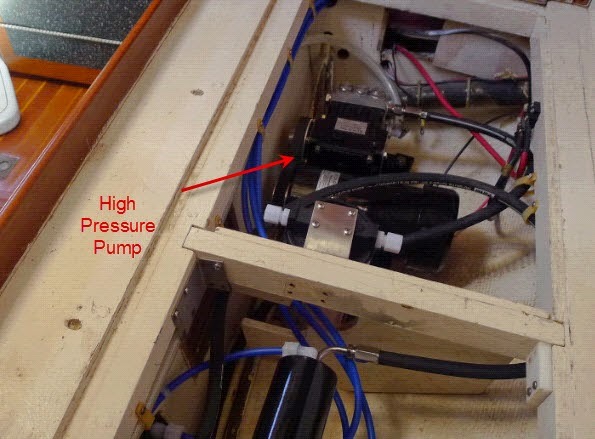 The pump pushes the salt water into the membrane. If you choke the exit of the membrane tube with the pressure valve it forces the water through the membrane instead of bypassing to an exit. Only pure water can go through the membrane. The salt stays and is carried away with the reject salt water. What comes out of the membrane tube is one hose carrying very salty water and one hose carrying 100 per cent fresh water. The salty water goes down the drain and back to the sea. 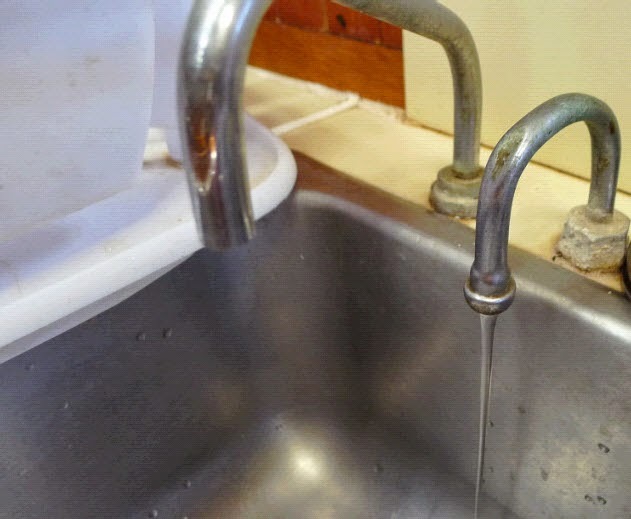 The fresh goes to a little faucet at the galley sink where you let it run for a while and you taste it to make sure it is good. Then you flip a valve and the water is diverted into the 150 gallon fresh water tank. We took about four days to hook everything up, taking our time to make sure everything was connected properly and that the layout was as straightforward as possible with few hard bends in the hoses and no place for air pockets to form. Since we were deep in the bilge we found lots of other things to do, removing extra wiring and cleaning up things. 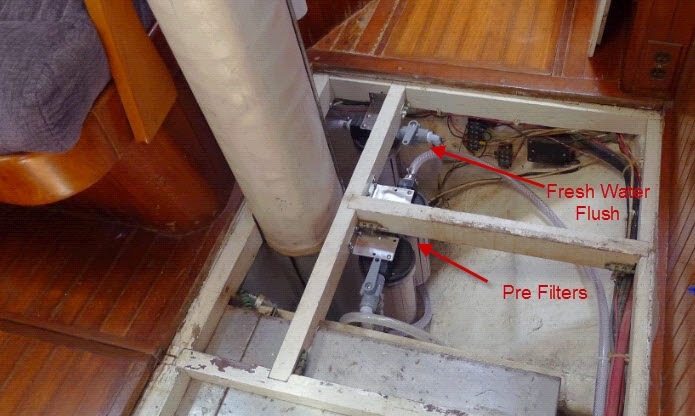 Connie became the hose installer with her head down in the bilge or under the sink running the low pressure hoses and pulling electrical wiring. We fired it up this afternoon and let it run for a while to get all the air out of the system and then it started cranking out pure fresh water. High Fives! We bought the 260DML unit that can run at 13 gallons per hour at 38 amps and when I cranked the pressure valve, sure enough we got 13 gallons per hour output. But, as Will had said, we could adjust the pressure valve and drop down to 8.5 gallons per hour and the draw goes down to about 20 amps. With the solar bringing in about 15 amps on a sunny day we can run the water maker with about a 10 amp deficit making 8.5 gallons per hour. (The refrigerator and other systems will be drawing about 5 amps.) When we are motoring (and have lots of power) we can ramp it up to full capacity and make 13 gallons per hour. So far, so good. We are another step closer to being off the grid. Our solar panels are providing us with lights, navigation, refrigeration, and now water. We are only carbon hogs when motoring the sailboat or running the outboard engine on the dinghy. But more importantly, we can say goodbye to marinas and fuel docks where we usually fill our water tanks. We can go up into the Sea of Cortez or across the Pacific Ocean for that matter and not worry about water water everywhere but not a drop to drink! Might our friends and followers be wondering what happened to the crew of Traveler in the past month? Did we drop off the face of the earth? Did the leaky thru-hull fitting burst and we went blub blub blub down to the bottom of the ocean? Or did we just sail off into the sunset? 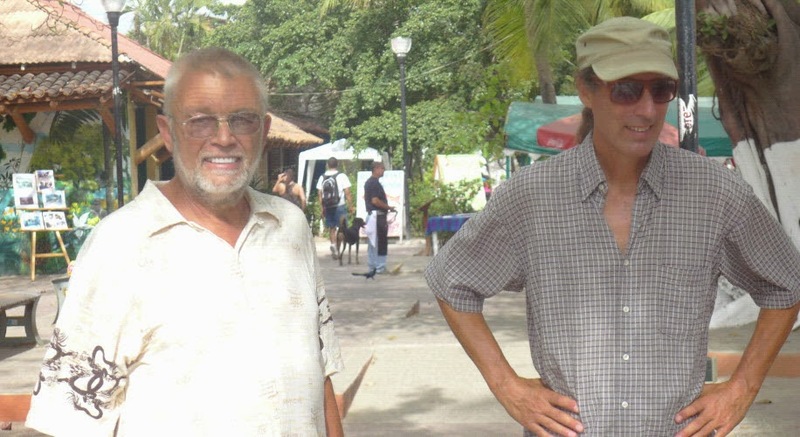 Since Zihuatanejo (and Paracho) we’ve been on the move, headed north, mostly. Now we find ourselves boat bound for a week in the windy harbor of La Paz while we assemble the many bits and pieces that will become our new EchoTec water maker. I’ll get out the boat log and calendar and try to summarize what’s gone down this last month since we left you in sunny Paracho Mexico. When we got back to Z-town from our land trip we found the harbor vastly emptied, more than two thirds of the boats had left in the week following Guitar Fest. Following suit we departed early in the morning in company with the sailing vessels Lungta and Nirvana. We had spent 16 days anchored in Zihuatanejo, enough time for a healthy crop of algae and barnacles to grow on the boat’s bottom. On the trip north I kept worrying that the critters on the hull were slowing us down but I don’t think that was the case. The first day out, we motored, then sailed, then motored again. We had a wonderful night sailing through calm seas with millions of stars overhead and found at dawn that Lungta had dropped far behind us and Nirvana had disappeared over the horizon to the north. We were on our own. About 10:00 the morning of the second day the wind died so we hit the starter and the engine would not start. While we rolled and bobbed Connie tried to keep us pointed into the swell and I checked the fuel system for leaks. Saw none. Then cleaned the Racor and replaced the filter. When I went back up to try a restart I noticed the kill pull-switch out slightly, a little bit open. I nudged it back in a quarter inch and she started up just fine. Duh! We passed Caleta de Campos and made it into Maruata just after sunset for a comfortable night’s sleep (at anchor) and an early morning departure. During the next day we had some good sailing until the thermal winds died, but the seas stayed active and we had a bouncy night motoring past Cabeza Negra and finally into the lagoon at Barra de Navidad at 08:30 the next morning; 72 hours from Zihuatanejo to Barra with 60 hours underway and 12 at anchor. Barra is such a fun town and we love to provision there so we stayed two days then hit the fuel dock for diesel and water and sailed around the corner to Tenacatita where we cleaned the hull and waited for our weather window. Connie was able to free dive down to the keel and the prop and I scrubbed the hull from the waterline to the top of the keel. I got a touch of hypothermia when I overdid it, stayed in the water too long and got chilled. Three days later we got a good weather forecast with light winds from the west/north west and moved the boat north to Bahia Chamela for the night. Approaching the anchorage under genaker Connie was pulling down the sail when 2 guys started circling us in their dinghy taking photos. Later they came by giving us the photos and shared their stories; nice to meet new folks. A leisurely start the next day made the timing right to round Cabo Corrientes at midnight arriving in La Cruz at first light. From Barra to La Cruz we had 19 hours motoring and 26 hours sailing. Typically, boats headed north do a lot of motoring. Many crews take motoring as a given necessity so they just hoist the main and plan on motor sailing the whole way, only rolling out the genoa if they find a beam or broad reach wind strong enough to move them at four knots or better. These folks make a schedule and stick to it. Then they stop at the fuel dock and pay the price. On the other end of the spectrum we have friends who will sail no matter what. Four knots is good! But one knot will do also. And when there is no wind… it’s time for a nap. You’ve got to have a lot of patience for such sailing but you save lots of money in fuel and you accept the luxury of time. Traveler does a combination of these two methods. We try to sail whenever possible, even if the knot meter dips below four. As long as the boat is moving forward and the ride is tolerable we keep sailing. When the wind drops altogether and the boat gets sideways to the swell then we start up the engine and head toward our destination. Often times the wind dies in the early evening but the seas stay lumpy and this is usually when we reluctantly crank up the noisy Mr. Perkins and keep him going through the night. We make good speed this way but sleeping is difficult and neither of us is very happy. It is such a relief to switch off the engine and hear nothing except the water on the hull! We reconnected with our friends Lane and Vicky on Adesso in La Cruz and spent a few days there. Our plans were similar and we thought it would be fun to buddy boat up the coast. I had also hoped to take the HAM radio exam and specifically timed our landfall in Bandaras Bay for that event but the exam was cancelled. I’ll have to find a location in the Seattle area to take the exam later this summer. On a day trip to Sayulita we got a late in the day weather report and decided to dash north for Mazatlan. Catching the next bus to La Cruz we zipped back to the dinghy dock. Adesso was not in her slip so we figured that she had just left hours before us. Unknown to us, Lane and Vicky had tried to leave in the morning but had to turn back when their engine developed a critical oil seal leak. They anchored right next to us there at La Cruz. But in our haste, we brought up the anchor and steamed away with them all the while not 100 yards away trying to hail us on the VHF and waving their arms like crazy. Evening found is at Punta de Mita but we didn’t find Adesso there. Darn, they must have headed north without us! On the run north from Banderas Bay to Mazatlan we kept thinking that we’d find Adesso anchored somewhere along the way when all along they were back in La Cruz dealing with a leaky seal. They eventually decided to repower, replacing their engine with a brand new one. As I write they are at the dock in Opequimar with Adesso floating high because she has no engine. How plans change! Chasing the phantom Adesso up the coast we rounded Punta de Mita and headed north. Seeing fishermen in pangas, we tossed out a couple of lines and boom! Connie caught a beautiful Sierra. While she was cleaning the Sierra I let the lure out again and boom! I caught a big Dorado! What a treat. We motored along with a big swell on the beam making it difficult to gut and clean both fish. In an hour we had the fish in the freezer and all the blood and guts washed off the deck. We collapsed into the cockpit in exhaustion as the sun rose high in the sky and the temperature soared. Chacala was a welcome sight and the anchorage there is nice if you anchor bow and stern, which we did, and later watched the other boats swaying largely, beam on to the southwest swell. Hmm, maybe we ARE learning some things out here. From Chacala we sailed and motored towards Isla Isabela but because we didn’t keep up the required four knots per hour we could not make the island before nightfall. On the way I saw a panga directly ahead with their crew waving their arms. I motored over to them and they motioned for us to follow. We did so and soon they stopped and pulled down a net so that we could cross over their long line. Big smiles and waves and we were on our way without getting line wrapped around the propeller. We passed Isla Isabella about ten miles on our port side and set the course for Mazatlan arriving there the next morning logging twenty nine hours of motoring (Ugh!) from Bandaras Bay. Looking at the calendar I see that we took three months to lollygag our way south from Mazatlan to Zihuatanejo and it took us only two weeks to make the “express” return trip back. Needless to say, the lollygag way is our preference. Marina Fonatur had an open slip for us so we docked there for a few weeks alongside our friends Chris and Heather on Legacy and Doug and Lynn on Miramar. Next door at Marina Mazatlan we found Hal and Nina on Luna Sea, also good friends of Adesso, who finally told us their sad tale of engine woe back in La Cruz. There were many familiar faces there in the harbor and we recognized many boat names on the VHF radio. Mazatlan is a hub of activity and many boaters spend time there provisioning and getting work done. Some cruisers make Mazatlan their stopping point for the season and fly or drive back to the States or Canada for the summer. We ran into our old buddy Bernie Maas who was just coming aboard a new boat as crew. Bernie has an interesting lifestyle for an old retired guy. An experienced sailor and one familiar with the Mexico coast, he chooses to sign on as crew hopping from port to port. In this manner he takes watches during passages, helps navigate, and troubleshoots mechanical problems aboard. For this he usually gets his way paid in room and board for the extent of the trip. Bernie goes up and down the coast from California to Acapulco with runs out to Hawaii on occasion. This guy does an amazing amount of traveling with short stints ashore as he looks for the next crew position heading for who-knows-where. The last we saw of Bernie he was headed to British Columbia via Hawaii on a boat delivery gig. Am I envious? No. But if I wasn’t so lucky to have Connie and S/V Traveler and a 402K then I’d be doing what Bernie is doing.. in a heartbeat. Connie and I headed over to the Marina Mazatlan parking lot to find our little Toyota Dolphin RV. She was there, intact, air in the tires, with a heavy layer of grit and a little note on the windshield advertising a car wash special. After connecting the battery she cranked right up! Toyota = Reliable. Now we had wheels. Connie vacuumed the grit and the dead ants out of La Dolfina’s carpet and scrubbed down the interior and we closed up Traveler and hopped aboard our land yacht and drove north to San Carlos where we stayed the night then continued on to the border at Nogales the next day. We always get searched by US Customs, always. They found and confiscated two apple cores and four fresh eggs. We parked overnight in the parking lot of the Nogales Walmart. Let me say that we NEVER shop at Walmart. Their labor practices are the worst, their product quality is cheap, and they don’t buy anything locally. Plus they tend to drive out local, mom and pop style business. Having said that, we do use their parking lot for the RV and we do use their restrooms. We are trying to start a movement. If everyone will just park overnight in the Walmart parking lot then their real customers won’t have a place to park! And all those folks coming and going to and from the bathrooms will clog the entrance way and clog the plumbing eventually driving the evil Waltons out of business. In Phoenix we visited with Diane, Tom, and the kids and had a whirlwind four days of provisioning, picking up parts, dry goods, tools, an air compressor, and our new water maker just arrived from EchoTec. The culture shock was extreme. Traffic, rude drivers, big cars, mean people. We’d say hello to someone on the sidewalk and they would avert their eyes. We’d say hola to the Mexican pruning the palm tree and he’d smile and buenos tardes us right back. After the obligatory overnight in the Nogales parking lot supporting our Anti-Walmart crusade, we crossed back into our beloved Mexico and made our way south through the desert to Guaymas, arriving just before sundown. We visited Marina Seca, a dirt lot dry storage yard and talked to some fellow boaters there. I believe we will be bring Traveler to Guaymas in early summer and she will spend the summer there on the hard. 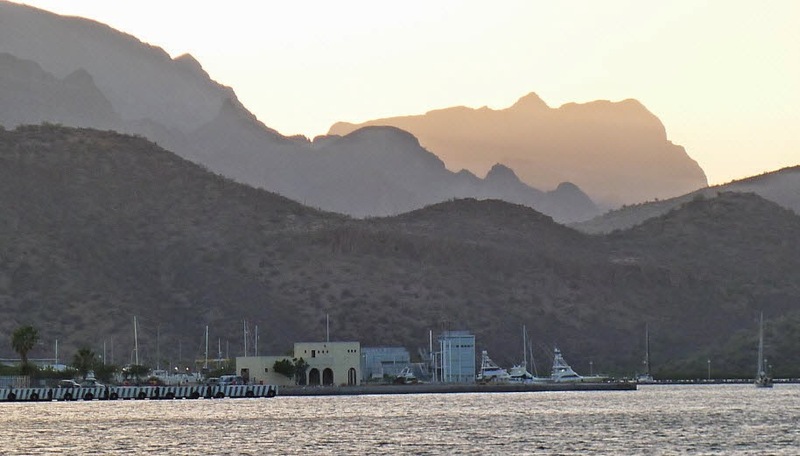 The benefit of the yard in Guaymas is that it is cheaper than storage options in San Carlos, and they have fewer rules. In Marina Seca we can bring the RV into the yard and park it right next to the boat while we ready her for the summer. We can also do our own painting, scrubbing, and maintenance on the boat. At sundown we drove just over the hill south of the boat basin to find a small dock and boat ramp where we hoped to be able to bandit camp the Dolphin for the night. There we found a place to park and a few finger docks with a couple of sailboats moored. Walking down the dock we spied our friends Birgitta and Eric on S/V Ariel IV. What a surprise! Big hugs all around and before we knew it we were firmly planted in their cockpit having dinner and drinking wine. We rounded out the night with Eric on guitar and Connie on the uke and Birgitta and I singing along. This lasted till midnight and then there were more big hugs all around. Morning found us on the long dry road to Mazatlan where we arrived at sundown without incident at the Fonatur Marina and our dear Traveler. A few days to clean the boat and do some provisioning and we welcomed aboard some friends I’d met online. Bob and Pam had just bought a Slocum 43, a sister boat to Traveler and Bob had been following our blog for a while reading about the boat and our adventures. When he pushed the donate button on our home page and bought us $10 worth of beer I got the notification and emailed him a thank you. “Do I know you?” “Nope.” What followed was a series of email messages about the Slocum / Passport series and how best to update and modify them for Mexico cruising. This led to that and I invited them down to Mazatlan, sight unseen, to help us with the crossing over to La Paz. 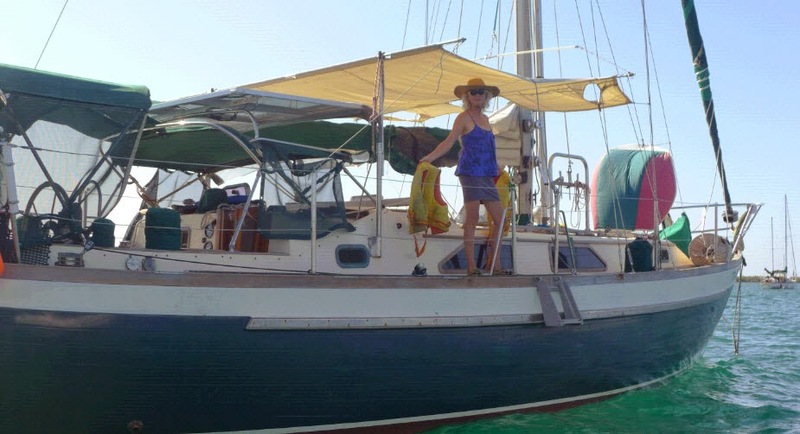 Bob and Pam generously provisioned Traveler and we headed west across the Sea of Cortez for an easy 48 hour crossing arriving in Los Muertos in the early morning. Pam cooked her way across the sea providing us with fantastic meals. Bob trimmed sails and stood watch. Connie started the trip a little sea sick but rallied the second day. I slept most of the way. Don’t you just love having crew? At Los Muertos we did some more hull cleaning and Pam swam to shore and back. Then we headed north the next morning, sailing to Bahia San Gabriel at Isla Espiritu Santo. After we anchored I reminisced that the last time we stayed at San Gabriel was in 2010 on the sailing vessel Sea Scrape and we got our butts kicked by strong coromel winds. Well, duh! Later that night the coromuel winds cranked up and kept us up all night. The islands near and north of La Paz are tricky because high winds and rough seas are common. At night, when the land on the Baja side cools, the winds funnel down the mountains to the Sea of Cortez, gathering momentum as the air drops to the warm waters. We experienced 30 knots of wind with 4 foot seas at San Gabriel, the boat tossing us about. Pam in the vee berth was often airborne. Bob sought refuge in the salon but had to hang on tight to stay on the bunk. Connie and I held onto Monkey and waited for dawn to arrive. In the morning we sailed around the other side to the protected anchorage at Playa la Bonanza where we had a pleasant day and a good night’s sleep. After the calm waters of Playa la Bonanza we sailed around the corner towards La Paz. We tried all sorts of sail combinations until the wind finally petered out and Bob negotiated the dog-leg entrance to the harbor. We found moorage at Marina La Paz and put a tearful Bob and Pam into the taxi early the next morning. What followed was chores, cleaning the boat, laundry and provisioning before we left the marina and found anchorage in the bay. We sit this May Day, the sounds of a parade in the distance and Banda music wafting its way across the water from the malecon. 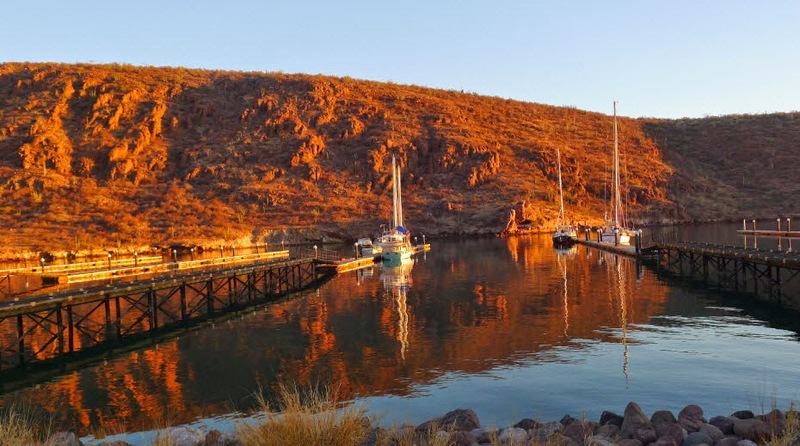 We are four days into the water maker installation with a couple more to go then we’ll do a provision, sneak some showers at the marina, and head north into the Sea of Cortez reaching territory where we have not been before. Up there provisioning stops will be smaller and further apart and our internet options will be limited. But the water will be crystal clear, the seascapes breathtaking, and the cerveza cold in the cooler. 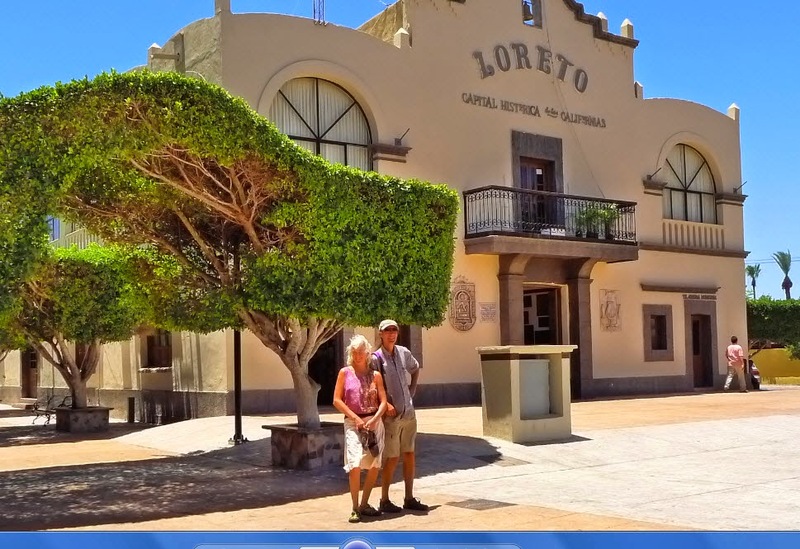 Anyone wishing to visit can send us an email and you can jump aboard in Loreto. 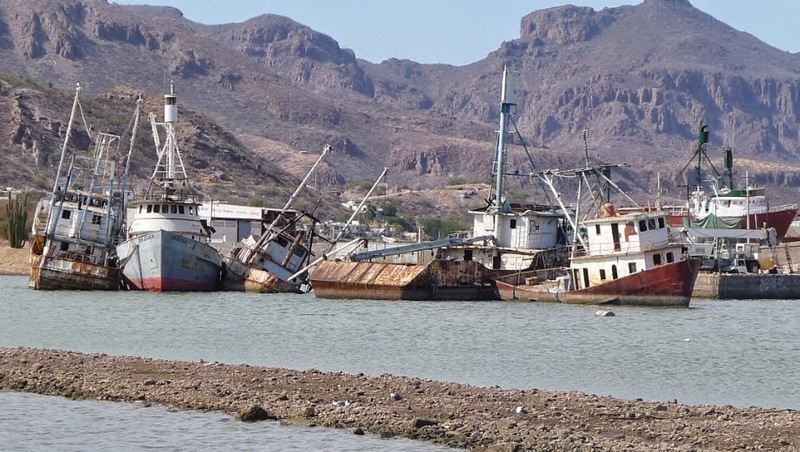 And to our friends making their way north as well, we’ll listen for you on the VHF and SSB radio nets and look forward to running into you in what the gringos call the Gulf of California but most sensible people call the Sea of Cortez.